Ten of the 13 members of the Cleveland Community Police Commission signed a letter to Steve Loomis asking him to resign from the commission last month. Among other reasons, the signees pointed out that Loomis had missed at least 10 meetings since January. "We recognize that every CPC member has other professional and personal obligations which prevent them from attending every CPC meeting. However, you are the only Commissioner who has consistently missed required meetings for many months, thereby not fulfilling Commission responsibilities," the letter read. It's not the first time someone has called on Loomis to resign from the commission. 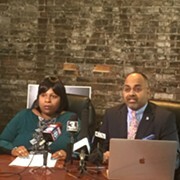 In January, the Cleveland branch of the NAACP suggested Loomis step down after fiery comments the police union president made about the internal investigation into officers regarding the 2012 police chase and shooting deaths of Malissa Williams and Timothy Russell. "This was a kangaroo court," Loomis said at the time. "They put a hat together and pulled names from a hat to get the numbers they wanted... I promise you all six officers are going to get their jobs back." "You cannot advocate for police reform, and at the same time defend individuals who for all intents and purposes, violated every tenent (sic) of their training and obligation to serve and protect all citizens, including Malissa Williams and Timothy Russell," the NAACP said in its letter to Loomis. He didn't resign then and he's not resigning now. Loomis followed the commission members' letter with one of his own. It is lengthy and diatribe-y, Loomis' preferred style of communication. Among other claims, he said, "The amount of energy and effort to remove the only heterosexual, white male, conservative, Catholic, married father and grandfather, military veteran, 23 year resident of Cleveland with 23 years of decorated law enforcement experience is unfortunately telling, typical, and continuously disappointing." Read his full missive below. Once again I find myself devoting a significant amount of weekend not working on matters of the CPC as mandated by the consent decree, but wading through the minutia set forth by some overreaching members of this commission. The message clearly being sent by the attempted manipulation of the bi-laws, the manipulating of fact, the secret meetings, e mails and discussions excluding some members, as well as the release of internal documents that when presented by Lee Fisher, Dr. Connors, and Dylan Sanders were specifically and clearly said to be internal and confidential, is intolerance at all costs! The message is that some on the commission will not tolerate a commissioner or citizens who dare have opposing experiences, opinions, or political views. Most on this commission show their hypocrisy by demanding tolerance, open mindedness, and transparency from everyone but themselves. The amount of energy and effort to remove the only heterosexual, white male, conservative, Catholic, married father and grandfather, military veteran, 23 year resident of Cleveland with 23 years of decorated law enforcement experience is unfortunately telling, typical, and continuously disappointing. Intolerance and agenda driven manipulation of fact, the wasting of tax payer money, and the submission of impractical, Dangerous and personal agenda driven ideas will be the legacy of the CPC and not the true desire to improve the way law enforcement and the citizens we serve interact. 1. Autonomy and Operational Independence. ?While it is clear that the Commission is a creation of the consent decree, it is not at all clear that it was “formed” pursuant to the cited provision of the City Charter. The consent decree does not mention this Charter provision, Commissioners were not appointed as required by this Charter provision (and there is a significant issue about whether the Mayor could delegate that discretion to someone else), and the Commissioner (Chief of Police) neither schedules meetings nor chairs them. It has been said that the Chief somehow delegated those functions to the Commission, but there is a significant issue about whether he can lawfully do so. Further, the consent decree’s “independence” mandate is clearly in conflict with any thought that the Commission is somehow a body created under that Charter provision which makes a Commission created under it subject to both the Mayor and the Chief’s discretion. Once again, I think we are overreaching. ?It is certainly clear that the power to appoint persons to the Committee is vested in the selection panel by the consent decree. The Mayor has no independent power to appoint (which raises the issue of the recent appointments to the Commission inasmuch as it does not appear that the consent decree process was followed). There is no provision for removal. In any event, reciting in the bylaws that the Mayor has appointment or removal power, or the Commission has this or that power, does not make it so. 2. Decision Making and Quorum and Electronic Voting. ?A simple majority of the appointed Commissioners (for both quorum and vote) is, in my view, insufficient. It is important that as many voices as possible be heard, especially when voting on Commission recommendations. I recommend that two-thirds of the appointed Commissioners constitutes a quorum sufficient to conduct business (effectively vote). A majority of that quorum is fine; on the electronic front we need some language that establishes how an assured quorum would be reached. In any event, it needs to be clarified that a simple majority is sufficient only when there is a quorum present for all voting. ?Electronic voting is fine (as long as an assured quorum is present), but unless we post the actual vote and the email deliberations leading up to the vote it is not a transparentprocess. E-mail is, I suppose, a nice tool but it is not at all transparent; as currently set up, all those communications are inaccessible to the community as they occur. This is vastly different from deliberations conducted at public meetings. How do we on one hand demand that everything we do is transparent to build trust with our community and then do most of our work in secret? Finally, the Chairs can e-mail material to Commissioners for feedback and final approval but there is no restriction on how long before the feedback deadline or the vote that must be done. Without casting aspersions, this power is the power to force decisions before others have time to analyze, think, and respond. Let’s remember we are all volunteers with day jobs. ?I also recommend that all votes be recorded without a specific request by a Commissioner. I can’t imagine why we wouldn’t. ?I’m unsure why the second sentence of the first paragraph has been removed. Seems like even “late” notice is better than no notice at all. ?In paragraph 4 of the proposed language, there is the vague phrase “…recommend an action to the Commission as needed.” What does that mean? ?It is unclear which of the two descriptions of an excused absence is the actual proposal. Are these the only possible reasons an absence can be excused? What about other work commitments? What about exams for our student member? Does it matter what an out of town trip is for? What events are sufficiently religious or cultural? I think specifying certain reasons as the only legitimate reasons creates more problems than it solves. ?The meeting minutes provision ought to be phrased such that the absent Commissioner “may” make comments rather than “shall”; Commissioners may not have a comment but would violate this provision if they failed to comment. ?I cannot imagine what the voting status provision is about, other than simply a way to deny Commissioners the right to vote. It reminds me of attempts to deny people the right to vote if they haven’t voted in the last two elections. This is unacceptable. Commissioners should always have the right to vote on Commission business. ?Since the Commission has no power to remove, this language is inaptly, but tellingly, named. The process is also ultimately futile since the decision to remove will be made by someone else. The language “…or for a cause deemed reasonable by a three-quarters (3/4) majority of the appointed Commission” is clearly designed to squelch dissenting or differing views. 2. The phrase “…the Co-chairs shall seek facts to substantiate the concerns about the Commissioner…” seems awfully biased to me. 3. Seven (7) days to respond seems an awfully short period of time within which to gather information and prepare a response. Perhaps thirty (30) is more reasonable. 4. Very confusing. It is unclear as phrased that the Commissioners are voting to make a request for removal. Why would the Commissioner at issue be denied attendance to defend him or herself (why is there no “hearing” process?) and why would the accused be denied a vote? 5. The Commission has no authority to impose penalties on any Commissioner, let alone ones that strike to the heart of the authority and responsibility given to him or her by the consent decree. This is simply removal by some other name. Finally, permit me to comment that the process as outlined does not provide any recognized elements of due process, including adequate notice and time to prepare a response, access to information, the ability to confront one’s accuser(s), a fair and impartial hearing, etc. To me, that is a fatal flaw. Warmest Regards, have a great Thanksgiving.